The 2019 Kia Sorento, having undergone several major changes and an improved appearance, carried me on Wednesday, Aug. 22, to the Stanley Hotel in Estes Park for a luncheon of the Rocky Mountain Automotive Press (RMAP). All Sorentos for ’19 have been designed with three rows of seats for seven passengers, as Kia has done away with the two-row/five-passenger setup. 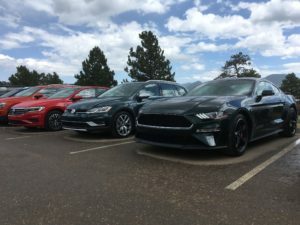 The model that came my way is the loaded-up SXL all-wheel-drive SUV, powered by a 3.3-liter, V-6 engine tied to a new 8-speed automatic transmission. The optional 2.0-liter, turbocharged 4-cylinder of the past several years has been scrapped. Base power for Sorentos of lesser price is a 2.4-liter, 4-cylinder with 6-speed automatic. Also added for the new model year is an enhanced safety system – lane-keep assist, automatic braking with pedestrian detection. With its standard three rows, the Sorento will compete with the Chevy Traverse, Honda Pilot, Nissan Pathfinder, Toyota Highlander and Volkswagen Atlas. With a bold grille, full LED headlights and Nappa leather inside, the Sorento looked good as I parked it high above the Stanley lot reserved for other new cars and trucks arriving at the hands of RMAP members. The variety of the others ranged from a Ford Mustang Bullitt to a Nissan Leaf to a Mercedes Sprinter van. The Stanley stop was part of a two-day RMAP event, based at Woolley’s Classic Suites in Aurora. Among RMAP members participating was their new president, Craig Conover of Springville, Utah, who succeeded David Muramoto at the helm in early June. I drove to Estes from Greeley for the lunch meeting. Distance from my home to the Stanley Hotel in Estes Park is 47 miles; for the 94-mile roundtrip, the Sorento averaged 24.1 miles per gallon. Its EPA estimate is 19/24. Tablemates with me at the lunch, hosted by Fiat Chrysler, were Jerohn Anderson, product communications specialist for Volkswagen of America; Russell Datz, national media relations manager for Volvo Cars USA, and John Rush and Richard Rush, RMAP members from Drive Radio. Discussions among us included VW’s improved Jetta for 2019 and the company’s aggressiveness in the SUV/crossover categories; Volvo’s push toward electrification while continuing to prosper with some of the best-performing internal-combustion powers; and whether a move to autonomous vehicles could occur as quickly as a five-year cycle. 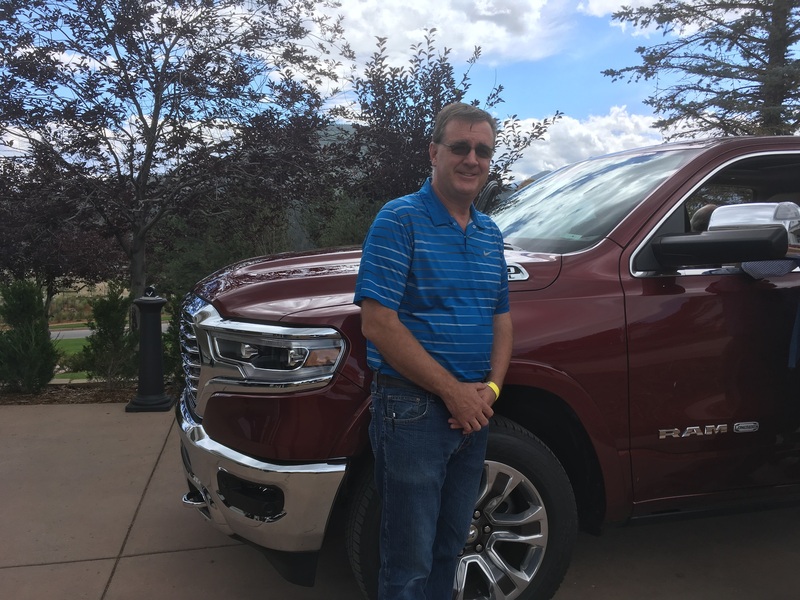 Ryan Nagode, a chief designer for Fiat Chrysler Automobiles, headed a presentation of the 2019 Ram 1500 Longhorn Crew Cab pickup on the walkway outside the lunchroom before the group headed back toward Aurora. He talked of lighter, stronger, high-strength steel frame, 395-horsepower 5.7 Hemi engine, 12-inch UConnect screen, reclining rear seats, deployable side steps, sticker price of $66,000. I was out front when the truck was parked and a Stanley official insisted, since it was on the walkway, that a shallow pan be positioned beneath the truck’s engine compartment. Yes, during Nagode’s presentation, I thought of asking him if the drip pan came standard with the truck, but I’m too far along in years to add “smartass” to my resume, so I did not. 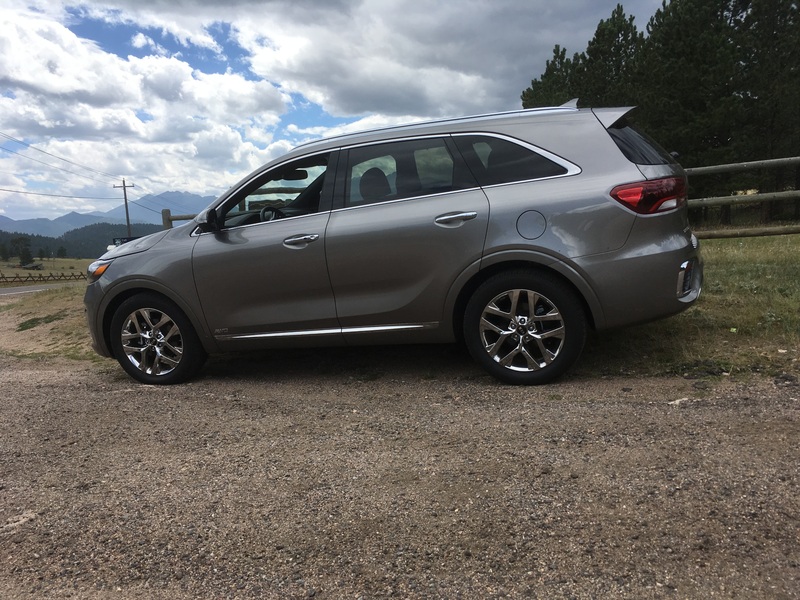 Regarding my drive with the Sorento’s V-6 and 8-speed automatic, strong and steady power was displayed on the drive to Estes, and it climbed through the two switchbacks on the Devil’s Gulch Road in lower gears of the manual-mode shifter. On the return drive, mostly on a descent, 3rd and 4th gear sets in the manual mode were engaged. Though pricing for the cheapest Sorento LX all-wheel-drive model begins around $30,000, the impressive SXL I drove carried a sticker of $48,020. That included full-length side-curtain airbags, hill-start assist control, dual-zone automatic climate control, Harman Kardon premium audio with navigation, Android Auto, Apple Carplay, Bluetooth, heated and ventilated front seats, heated leather-wrapped steering wheel, surround-view monitor, smart cruise and panoramic roof. The Kia is backed with a 5-year, 60,000-mile basic warranty and 10-year, 100,000-mile powertrain warranty. The Sorento’s overall length of 187.4 inches is a foot shorter than most of the competitive three-row makes, and it is costly in the fact the Kia’s cargo space behind the third row of seats is only 11.3 cubic feet. Fold the third row and that expands to 38 feet. The Sorento has a hands-free power liftgate which opens when it senses a smart key approaching. The Sorento AWD weighs 4,343 pounds on a wheelbase of 109.4 inches, with 7.3 inches of ground clearance. Tow capacity is 5,000 pounds.